What do you do when the job applicant doesn’t fit the job description? You’ve advertised for a new staff member to replace someone who is leaving your organisation. As part of the ad you have listed a reasonably detailed list of skills you require based on the past on the tasks completed by the current incumbent. You decide to interview the top ten applicants based on their resumes and references and include a couple who don’t have the full list of skills you require based on other strengths they appear to have. After the interviews you realise the most outstanding prospect is shot in two skill areas you require. In spite of that you realise this patron would make an outstanding employee and a dd great value to your organisation. So what do you do? Do you 1) pass up on all that potential and accept a lesser person because they have all your listed skills or 2) would it be better to redesign the job scope and find another way to fill the skills gap? For my money, number two will always be the better option. 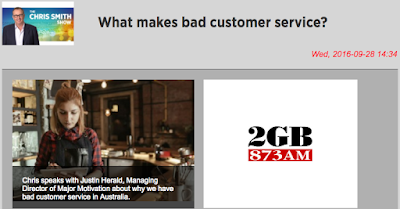 Chris Smith of 4BC speaks with Justin Herald, Managing Director of “Major Motivation” about why we have bad customer service in Australia. 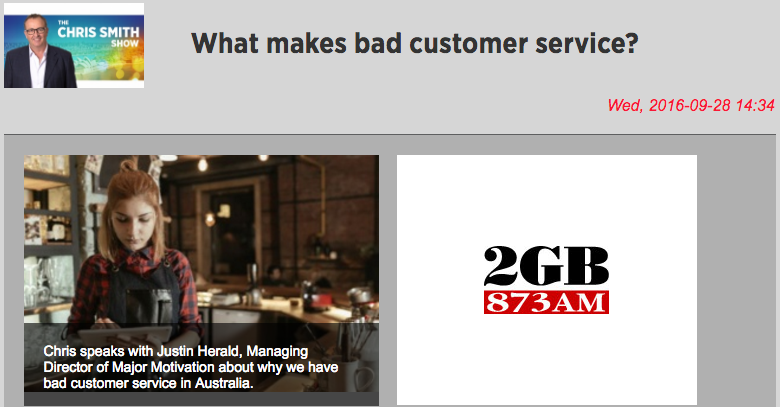 Recorded Program… on demand 2GB. http://www.2gb.com/audioplayer/206961 Well worth a listen! It may be hard to see a link between career success and Empire Avenue however there can be a strong link which I will hopefully explain. "Social media has made it easy and acceptable for you to advertise your skills and to connect with others who may be interested in your professional services. If you're not using it you could be missing out on opportunities to advance your career interests." - Corinne Mills is managing director of Personal Career Management and is author of several best-selling career books. Self promotion, if done correctly, is an essential part of any personal career management plan or career success formula. Being published or even curating valuable information that relates to your expertise or industry is a great way to impress both your customers and your employers alike. As a young supervisor I was asked to write an article on behalf of my employer on equipment leasing for a prestigious accounting magazine. The article was then republished in both government guides and other professional publications. Within six months I was promoted to the department manager and within two years was managing one of the companies largest branches. Sure you still have to perform your tasks well however if no one notices you then you don't get offered the opportunities to excel. That brings me to Empire Avenue's potential to enhance your career success prospects. "The People you interact with, and learning different ways to leverage social media.﻿"
"Excellent place to find other's content and draw attention to your own content ....and you meet some great (and influential) social media people." 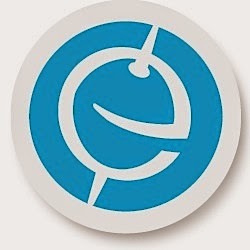 Empire Avenue lets you amplify your content and social awareness. It taps you into a network of other creators, curators and community moderators with a similar goal; to increase their social worth. By investing in others, like a social stock exchange, and by completing missions or requests on your time, you are able to earn virtual I.O.U. points which can be saved up and traded in when you have some content or profiles of your own that needs a boost. "How does all this help your career? Simple. 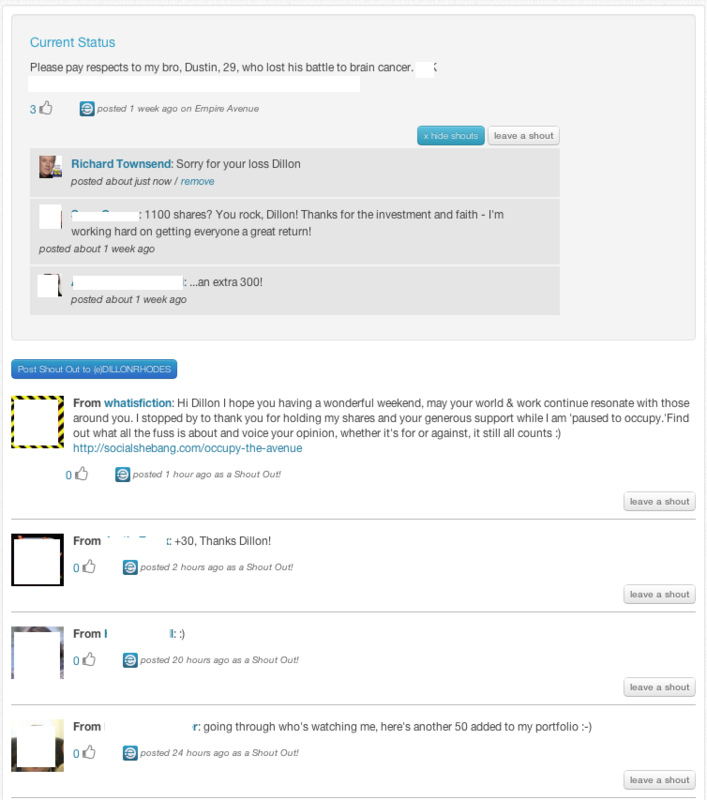 When you connect with people on Empire Avenue who share your interests, they aren't just random people. They are people who are active and influential in social media. So, when you write an important article, they can help you stand out in the (very) crowded online space. Instead of disappearing into the online void, your article -- or your pages or your Twitter feed -- are seen and shared by more people, which validates your expertise and your influence. You can use that to raise your own profile within your profession or to help your employer. Of course, you'll need to create or curate good content, and you need to nurture your Empire Avenue relationships. When you do both, the results truly ARE social media rocket fuel." Rotary is an organisation principally made up of successful professionals. Many non Rotarians seem to think of it as purely a networking organisation or a do-gooders club. Obviously doing good things for your community, country and even world wide is facet of Rotary and a basic part of the reason for its existence. As for networking, well of course, again as with any group you join, the crucial personal success factor of networking is part of the deal. From a business owners point of view however, Rotary is much more valuable! I often read articles claiming there is currently a shortage of business soft skills, particularly in our younger workers. Over my 30 years in Rotary and looking at it from a business persons perspective I have found that the organisation has an important benefit not often mentioned in its literature. Rotary represents possibly the cheapest and most effective staff "soft skills" development tool available to organisations both private and public. Although a British example from the "National Careers Service" here is a list of essential soft skills they published that I believe also fairly represent the skills requirements/problems employers also face in Australia and many other countries. They state: "…[essential] soft skills, which tend to be either personal characteristics or skills that have been fine-tuned over a period of time are:"
"When you look at that list and how valuable these skills can be to organisations, it’s a wonder they call them ‘soft skills’, because they are very important and hard to learn!" Adaptability: "Understand the need to have a passion for continuous learning and the ability to continue to grow and stretch skills to adapt to the changing needs of the organisation,"
Problem Solving: "What to do, how approach a problem, how to involve others to help and how to assess the outcome in real, measurable results." Conflict Resolution: The ability to persuade, negotiate and resolve conflicts is crucial at all organisational levels. "Wherever people gather there will be politics", personality differences and competing agendas. Can Staff "Learn Soft Skills"? "The good news is that, like any skill, soft skills can be learned. The better news? Boosting your staffs soft skills not only prepares them for a promotion or taking on more responsibility, it will also have obvious applications in all areas of a person's life, both professional and personal." "Seek Mentors": A great option however as the boss do you have the time and/or do your senior managers have the skills to be mentors? Wouldn't it be great to get some 'free' outside help? "Volunteer: Working with nonprofit organisations gives participants the opportunity to build soft skills." Aha here comes Rotary. "Team building, fundraising, public speaking, planning, organisation, and communication are just a sampling of the leadership skills that club members can exercise and enhance. Being a Rotary leader provides further experience in learning how to inspire and guide [manage] others." Well that's a start however it's pretty much an unsubstantiated claim… where's the proof. Firstly I should point out that Rotary gives it's elected officers power. The important point is that the power comes without any legitimate authority. Because it is an organisation of volunteers even as the president you cannot insist on anything. You must convince the board and members that doing what you ask of them is in the best interests of all concerned. Not an easy task at times. From a business owners point of view it is better for managers to learn how to do that in a volunteer organisation than having them destroy the morale of your workers though the misuse of their legitimate authority at work. Communication. There are many opportunities to speak in meetings. As a member individuals will be called upon to introduce or thank guest speakers. As a director individuals will be asked to present/report on what their committee is doing regarding projects you are involved in. If you act as club sergeant you will need to tell stories about other members for which they will pay a small 'fine'. In this role you will also learn how to develop a little comic relief into your public speaking. As you progress you will need to do presentations to the wider public. Making Decisions. This critical business skill will be developed through involvement in club, district or global projects. As with any organisation money is involved and other peoples money at that, so well considered actions and an understanding of desired outcomes is essential. Example: Your club is offered the parking duties at a local event in return for gaining permission to hold out a gold coin donation bucket. You will have to assess, will the funds to be raised warrant the manpower needed. Is the organisation running the project legitimate and capable of making it a success? Does your club have the levels of manpower required or will you need to negotiate a joint venture with another group in order to do the job properly. What other resources such as shelter, refreshments, signs, money collection procedures, safety procedures, to mention just a few, do you need? What support for the workers must you provide and how will the work be divided up? Showing Commitment. What can I say. Those that are not committed in Rotary even have their own anagram, they are called RINOs, Rotarians in Name Only. They are the one's that come late, eat and leave early. They are the one's who never volunteer and when they do tend to stand around and watch other members work. They are the one's that see Rotary only as a place to sell their wares. The social pressure that results from other members usually sees them out of the club pretty quickly. If however an individual shows commitment to the clubs goals they become a great ambassador for your business. I have only mentioned a few of the benefits of being a Rotarian here, however if you want to develop the leaders of your organisation I state again Rotary represents a great opportunity for your organisation to do that and in a cost effective manner. Some years ago I was involved in a project in the western suburbs of Brisbane to improve the facilities at a school for aphasic children. The project called the raising of the school on higher stumps and the building of three classrooms under the raised building Construction required everything from architectural design & engineering to the manufacture and fitting of walls, windows & doors, plastering, painting, pluming and electrical. New paths, stairs and balconies where also required. Two Rotary clubs collaborated on the project. The time to do the project was six months and required fairly constant work. The technical skills were drawn from club members. money was raised through grants and Rotary fundraising activities. Thinking about the team skills mentioned above obviously they all came into play. The team that did the work were not contractors but Rotarians themselves. I still remember sitting on a trestle next to a 70 year old GP while we chatted and painted outside walls of the building. They guys and girls in the team included, architects, insurance company and bank managers, a plumber, a service station proprietor, doctors, a car dealer, a grocery wholesaler, solicitors, retail managers just to mention a few. All the mentioned effective teamwork skills came into play and I learnt valuable lessons for life. All were volunteers so no one had the authority to boss other around however through their demonstrated human relations skills they bossed us around plenty… I mean they effectively elicited our eager cooperation and we all learned a lot about ourselves and how to work with others across a broad spectrum of society. By the way the 70 year GP was a pretty lousy painter… then again I wasn't that good at it myself. So will you nominate one of your managers with high potential in your organisation to become a Rotarian AND make the monetary investment as well? Oh… how much will it be for all these staff development benefits? Best estimate: Membership $280 p.a., Meals $25.00 X 26 a year $650, Meals $10 X 12 a year $120 and Events $35 X 5 a year $175. Total $1225. Time the (paid or unpaid) staff member will need to invest 156 hours or 6.5 days. No that large an amount to invest when you consider the training cost for just 2 days of leadership training only I mentioned above. This is easy surely to justify for any successful business. Well you know better than I how that needs to be done. In my case my boss Chris Fletcher called all the senior executives of the finance company together at a small ceremony and said: "congratulations on being appointed to Manager of our third biggest branch at Parramatta, you are the youngest manager we have ever appointed, I am sure you will do a great job and of course enjoy your TIME IN ROTARY". "What" I said "I don't want to hang around with all those ancient old blokes". To which he replied, "do you want the promotion Richard". "YES" I said… and the deed was done… and now thirty years later I am glad he insisted. One of the biggest communication errors I constantly encounter is the using of industry buzzwords, jargon and acronyms. This practice can and usually does, create annoyance, at best and misunderstandings at its worst. My advice is work hard to get the fuzz out of your communication style. Oh and often the lister will just see you as someone who is trying to show off. Can everyone define exactly what you mean from what you say. No some concepts can be hard to explain so you must periodically check the listener knows what you are on about. The are two ways to do that. You can ask do you have any questions which is OK however its better to seek a explanation from your listener. That can be difficult however the best way to do that is to ask the listener this question: "To ensure I have conveyed my meaning well do you mind putting what I am saying into your own words so we perfectly understand each other." Note: Never ask the question "do you understand". Another common complaint I hear is that many people waffle on or go round in circles rather than getting to the point. Use short and well considered sentences and words to convey your message. Get to the point of your communication early, don't go into a long winded wind up. If the lister wants background they will usually ask for it, or you can ask if they need more information. Is the meaning of your message clear? A great opening to any communication is "I want to discuss xyz because…. followed by "whatever" after the opening. If you use this phrase you alert the listener to the topic and importantly your motivation for the discussion. People can't guess what you're thinking. you have to let them know. Are the words you are using appropriate to the listener? Avoid big words they can confuse the listener. Avoid jargon at all costs.. its just dumber than mud. Here's the proof that social media activity needs to be personal and cannot be automated. Read it carefully and you will understand why most of the Eave players were dumber than mud.